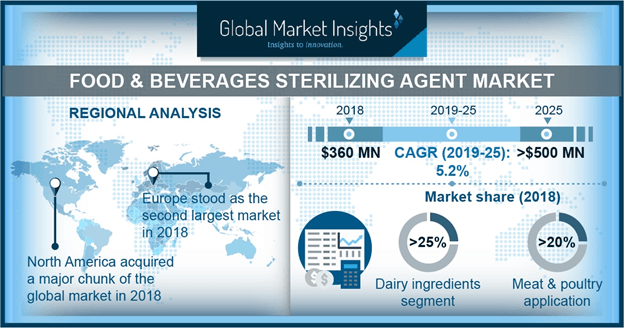 F&B Sterilizing Agent Market size will surpass USD 500 million by 2025; according to a new research report by Global Market Insights. Sterilizing agent market has been witnessing a consistent growth rate since the last few years and is even forecast to pace its growth in the upcoming era. This steady growth is strongly driven by favorable food & beverage industry throughout the globe followed by surging demand of healthy packaged food items in developed nations as result of economic growth, increasing purchasing power and growing market players in the sector.